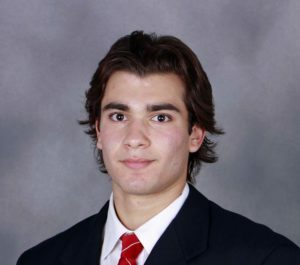 Wisconsin sophomore captain Luke Kunin will assume that same role with Team USA for the upcoming 2017 International Ice Hockey Federation World Junior Championship later this month. Kunin, who leads the Badgers with 11 goals through this season’s first 16 games, has already been captain for another version of Team USA. The Chesterfield, Missouri, native captained Team USA to gold at the 2015 IIHF Under-18 World Championship and scored six goals in seven games during the tournament. Kunin is the 15th overall pick by the Minnesota Wild in the 2016 NHL Draft and spent 2013-15 with the U.S. National Team Development Program on the U-17 and then the U-18 team, taking part in a number of international tournaments. The upcoming World Junior Championship takes place in Montreal and Toronto from Dec. 26-Jan. 5. The United States will open up group play against Latvia on Dec. 26 at 2:30 p.m. CT at the Air Canada Centre in Toronto. the coach of Team USA in the 2015 World Junior Championships. Osiecki was a top defender on Wisconsin’s 1990 NCAA Championship team. He also served as an assistant coach under Mike Eaves at Wisconsin when the Badgers won the 2006 National title. His stay in Madison also included the trip to the NCAA Title game in 2006. Osiecki is currently an assistant coach in the AHL with Rockford. The World Juniors run Dec. 26 to Jan. 5 in Montreal and Toronto. Osiecki’s staff will include former Badger teammate Don Granato and former Badgers assistant Kevin Patrick. Granato is currently with the National Team Development Program while Patrick is an assistant at Vermont.